When you’re faced with a huge amount of stuff to declutter, clean up, or organize, it can be tough to know where to begin. 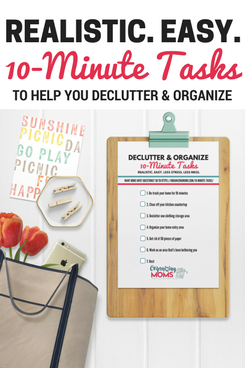 One strategy that’s helped me to get working on organizing and decluttering our house is the 10-Minute Tidy. If you’ve read my about page, you know that I’m not naturally organized. I also don’t like to clean. At all. I DO like to get stuff done and make progress. But, when I’m faced with an overwhelming task, I tend to procrastinate, go on Facebook, research on Pinterest, and eat a lot of chips. Not good. Pick an area to tidy up. Take a picture of it with your phone or a digital camera. Set a timer for 10 minutes. I usually use the one on my phone or the one in our kitchen. Tidy up the area for 10 minutes. Don’t let yourself get distracted! When the timer goes off, snap another picture. Compare the before and after pictures. Celebrate the progress, even if it’s very small! Taking the pictures helps me a lot, because I am able to see that I made some sort of progress. It also helps keep me focused when I’m tidying because I know I’m going to have to take a picture at the end, and I want to see some kind of an improvement. What Can You Use a 10-Minute Tidy For? Cleaning. Especially if it’s something really disgusting. Cleaning up dishes after a party. How Can I Stay Focused During a 10-Minute Tidy? Listen to podcasts while you work. Chat with a friend on speaker phone. Listen to music. Get Work Done Music is a free site that plays fast (or faster!) music to keep you motivated. Have a favorite show on in the background. Post your before pic on Facebook before you start working, and promise to come back with the results after 10 minutes. Public accountability is really motivating. If you want, you can post your before and after pics on our Organizing Moms Community Facebook page. What Should I Do a 10-Minute Tidy for First? Whatever is bothering you the most. If your annoyance with mess is equally distributed throughout your home, I’d start with the kitchen or the laundry room. The kitchen is good because you spend a lot of time there. You’ll be able to enjoy the benefits of your tidying. The laundry room is also good because you spend a lot of time there, but there’s a good chance no one else does. 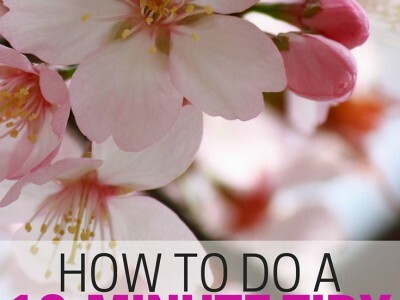 It’s less likely to be messed up by others shortly after you do your 10-minute tidy. Why Only Declutter for 10 Minutes a Day? Because spending hours upon hours organizing is only fun if you’re a professional organizer and you’re getting paid. Even then, the fun-factor is questionable. Because you’d rather spend your time doing other things. Because if you work on decluttering for just ten minutes a day, it’s totally do-able, and it will become a habit. Because if you stick to organizing for ten minutes a day for the whole year, you’ll put in over 60 hours organizing time! 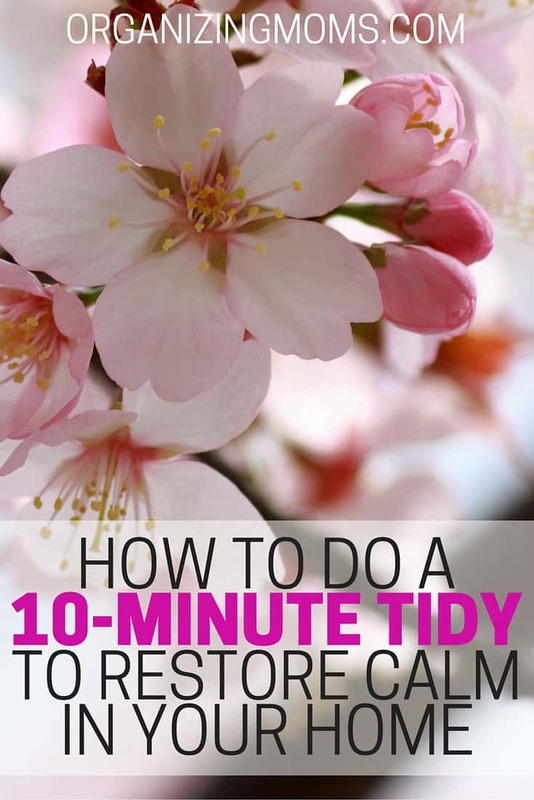 Have you tried doing a 10-Minute Tidy? How did it go? 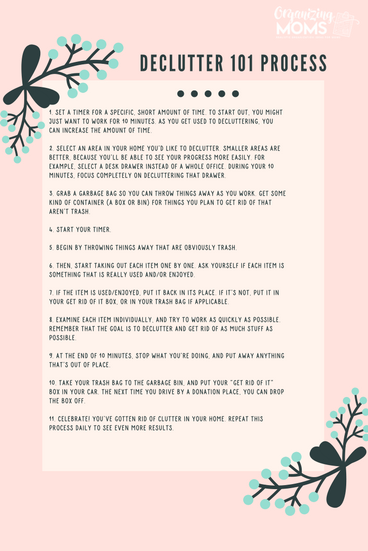 Get a free printable version of the Declutter 101 Process when you sign up for the Organizing Moms newsletter. Use the printable when you're decluttering so you don't miss a step!